beautiful condo spacious and comfortable. great ocean veiw. Recently rented unit 1801 for 4 days. Much too short of a visit! Condo was spacious, the kitchen was well equipped. It was great having a washer and dryer in the unit. The ocean views from the lanai were amazing! The owner also left a lot of beach equipment for your use. The complex is clean and well maintained. The nice thing is that the pools were never busy or over crowded! Bbq’s on site made dinner easy. We would definitely rent this unit again! This unit is in one of the best buildings at the Kanaloa condos. We have stayed many times at Kanaloa, and Know where the best views are. The location is unsurpassed, looking out over of the coastline of Keahou, Whales and spinner dolphins were spotted several times from the Lanai. We had a few internet issues, but was helped well by the local contact. Here are a couple of our suggestions to bring it to a 5 star review. First, the couch was sagging in the middle and not very comfortable to sit on, the dishwasher did not clean our dishes well, so we did them by hand some of the time. We love to cook a lot while on vacation, and some of the pans need to be replaced. These are just a few things that could be improved on. Overall, the unit was clean, and had some with lovely artwork. The grounds of the Kanaloa are wonderful, and the bbqs are always clean and conveniently located. We will return next year! When we reviewed the profile for #1801 it mentioned that it was a new listing and we noticed that there were no beach chairs and other outdoor gear listed. When we arrived we were pleasantly surprise to see 4 new chairs, beach umbrella, beach mats, kids beach toys, snorkelling gear and tennis rackets ....... everything you need to make your vacation enjoyable. To ensure the chairs stayed in excellent condition, we put towels on the chairs before sitting on them. Everything was clean and well maintained. We enjoyed the ocean front setting, as we watched spinner dolphins in the morning while eating our breakfast on the lanai. We recommend this unit for visitors coming to the Big Island. We wish we could have stayed longer!! This was my third stay at Kanaloa at Kona and this unit was by far my favorite. When you book online you always wonder if the place will be as nice as advertised and unit 1801 was. The kitchen had everything you need to prepare meals, there are mats for the beach and boogie boards too. You can’t beat walking down the hall in the morning, opening the sliding glass doors and taking in the view of the ocean and no need to rush to the ocean view pool to view the sunset, because you can see it from the lanai. Can’t wait to stay again next trip!! This was our second trip to the BI. Both times we stayed in 1801. Love that condo....it feels like home. Always spotless, and well appointed. The new ductless A/C works a treat. Very efficient. The new TVs also were appreciated. The views can't be beat, and the sunsets are nothing less than spectacular. Hope to book that condo next time we visit the BI. 1801 is a lovely condo right on the ocean--which makes a perfect spot for viewing the sunsets. My husband and I love to come to the Big Island and have a home base from which we can go on day trips. This year we spent some time in Hilo (enjoying the museum and book stores) and then all the waterfalls to the north. We also checked out some of our favorite beaches, did a little snorkeling, visited Hawi, and the National park just north of Kona--always on the lookout for honu-- and ate terrific seafood.The condo is roomy, well-equipped, and quiet. The grounds at Kanaloa at Kona are lovely and we enjoy watching the birds. Everything worked except the CD player--at least we could not figure it out--and we love to listen to Hawaiian music, alas. This Condo was perfect for the family vacation. We enjoyed sitting on the lanai especially in the morning and evenings where we could absorbing the beautiful view of the ocean. We even saw a few whales breaching a couple of times, what a thrill for those of us who have never been to Hawaii. The condo was well stocked and had all the ammenities required for our stay. My family truly enjoyed staying at this location as it was easy to find and within minutes of beaches. The assigned parking simplified parking so you didn't have to worry about locating a parking spot. The complex itself was very nice and the staff accommodated our questions about sightseeing opportunities efficiently. We loved our trip and stay! This condo was one of the nicest places we've rented anywhere - beautifully furnished, spotless, and an unbeatable view. The instructions for arrival were very clear and we had no issues during our stay - although I wish we had had more time to just sit and enjoy the view from the deck! The kitchen was well stocked and there was plenty of helpful info on the area. The bed was comfortable and the air conditioning worked perfectly - any problems in prior reviews have clearly been addressed.I wouldn't hesitate recommending this condo to my friends. My husband and I go to one of the Hawaiian Islands every year for my birthday. This year it was The Big Island, and Kanaloa at Kona was the place we stayed. We have stayed there a total of 4 times in the past, so we knew how nice the condo complex was. We picked 1801 this time because it looked exactly right for us, and it was. We had a good time and plan to come back. We recently returned from a stay in unit 1801 and it was lovely. The view from the lanai is better than the pictures! We spent a lot of time out there, coffee in the AM, happy hour cocktails for sunset and afternoons just staring at the view. The kitchen is huge and very well appointed. There is a nice BBQ area close to the covered parking area, we didn't get a chance to use it but it was convenient to the unit. The master bath was gigantic and well updated. The second was a little tricky as there is no curtain or door only a half wall that really doesn't keep the water in the shower. I dried the bath at every day. The property manager came as we were leaving and told us we were the first renters to take advantage of the new air conditioning units. They worked wonderfully and were very quiet. The entire unit was freshly painted as well. It is great to rent a unit from the owners as opposed to a resort or time share because they are so well appointed. There were condiments and spices in the kitchen which make it much easier to make a meal in. The beach equipment saves a bundle on rentals. We would definitely consider this unit for a return trip. Our stay at Condo 1801 was an enjoyable and relaxing stay. The ocean views are amazing, and being able to see the sunset every night was very memorable. At night, we could hear the waves crashing on the rocks very clearly. The condo was clean, instructions to get in was clear, and we had no issues getting in and out. The inside of the condo was generally darker than expected due to being on the south side and first floor. We will definitely consider this unit again when visiting Kona and the Big Island in the future. Thank you for having us. The ground floor condo with a view of the ocean and adjacent Sheraton Kona Hotel is easily accessible with a lovely vista of canoe paddlers and boats. We even saw a pod of dolphins! The condo itself is well appointed. The middling rating is the result of the failed air conditioning unit. We called the first day the local contact and he instructed us how to manipulate the wall control panel. Unfortunately it did not work and after a miserable night in the heat and humidity we called the next day and he arrived and confirmed that the unit had failed. He asked if we were comfortable allowing the HIVAC repairman in without our presence and we said no not wanting our personal belongings compromised and not wanting anything happening within the condo assigned as our fault for later billing. So we waited the next morning for the repairman and lost of half a day of activities that we had planned. The repairman said the entire unit and duct work had to be replaced. He meanwhile added freon in an attempt to cool down the air. We asked the local contact if we could be compensated for not having air conditioning as it was an additional fee. He said to contact the owner who was listed within a picture frame in the condo. The owner was surprised that we had contacted her, explained what happened and asked for a confirmation of the air-conditioning credit. It was done. Overall it would have been a better experience if the air conditioning worked. We were told that repairs would be done in June, 2017. Ruth, we refunded your AC fee and a $10,000 AC upgrade was performed the following month. We're sorry you experienced the difficulty and hope you will return. Really enjoyed our stay at 1801. Great views, and very relaxing. Loved the lanai, and being able to have morning coffee out there. Evening sunsets were spectacular. We look forward to coming back to 1801. It was exactly perfect for what we were looking for. This condo is in an amazing location with beautiful well maintained grounds and the most stunning view from the balcony. We witnessed spinner dolphins while enjoying lunch! This condo is very clean and has received many nice updates in the kitchen including counter tops and really great appliances. I very much enjoyed preparing meals for our family of four in the kitchen which was very well equipped. Bathrooms are fabulous and beds were comfy. Snorkels, fins and beach gear were available for us to use. Our kids 3 and 7 loved it the ocean view pool. Having been to the Big Island several times, this is my favorite area to explore the island from as you are close to great snorkeling, paddling, restaurants, farmers markets yet downtown Kona and it's shops are only about 10 minutes away. The stunning but more remote beaches of the north are only about a 40 minute drive away. The only reason I didn't offer the full five stars is because the condo is a little older and a little on the dark side in the main living area. Thanks for a fabulous stay and sharing your piece of paradise with us. This was our third stay at Kanaloa and our second stay at unit 1801 - it's the best of the best for two bedrooms in this complex! The location is fantastic, close enough but not too close to downtown Kona, and if you do need anything, shops are just up the hill minutes away. The condo is amazing - great layout, beautiful inside, the deck is above the walkway and gives good privacy, but you still have the lava and sea about 20 feet away - it's beautiful!! Also, the deck is the perfect place for some of the best sunsets on the island. The kitchen is lovely with high-end granite and everything you need for cooking your own meals and brewing fresh Kona coffee every morning (does need new cutting boards). The complex has a wonderful gas grill for close, quick outdoor cooking and the adult pool, is just a few steps further. The other pools are really nice as well, and the hospitality personnel are really nice. Parking is included and it's not very far. The condo has top-end amenities, soaps and shampoos, citronella candles, plush bath towels, all the water toys you need (boogie boards, coolers, so forth)... all there for you to use. The sound system is good, the wi-fi is reliable, you really feel like home. There are just a few little nit-noid things that keep this condo from being 5+ stars... the TV in the master bedroom can't be changed with a remote - that's a pain when you are laying there at night not wanting to get up to change the channel; definitely not a show stopper but a nuisance. Also, the AC... you have to pay extra to get AC, but there is a timer that limits the AC to four hours at a time. That means when you come back from a day of fun in the sun, your four hours ran out a long while back and the condo is warm. That also means someone has to get up in the middle of the night to reset the timer. If it's cool enough to sleep with the windows open, you can hear the sea and that's really nice, but if it's a hot and/or muggy day, that four-hour AC timer is a serious nuisance. I'd deduct 1/2 star for these things, but these things would not stop me from staying there again... it's a super, great condo and we loved it just as much the second time around. We absolutely love this condo and have stayed there 3 other times and plan to go back as soon as we can. You can't get a better view. Seeing a whale while sitting on the lanai was an added touch! The condo is very spacious and includes WIFI. It is great that it is so close to shopping for groceries or grabbing a bite to eat. We highly recommend this condo! We enjoyed our second stay at this wonderfully-located condo in the Kanaloa complex. The prime ocean front location is unequaled in this slice of the island. In the morning, the ocean front location is ideal for watching whales, boats, kayakers, paddleboarders, and canoers; in the evening, the location is ideal for dinner on the lanai. The condo is comfortable, updated to contemporary standards, and private. The master bedroom and bathroom are spacious and remain cool (keep the shades drawn against the sun). A second couple shared the condo with us and were comfortable in the guest bedroom and guest bathroom as well. The kitchen is spacious and appliances worked well. Our only recommendation is to update/replace the cookware, especially the pots and pans. A set of well-designed, non-warping stainless steel cookware would definitely enhance food preparation. I was worried that the waves would be too loud and keep us awake, but the sounds were just right. Great location and the kitchen was very functional. The air conditioning instructions recommended to close the patio doors when running but did not clearly state that the patio doors HAD TO be closed for the AC to work. This caused some time to be spent figuring that out and had to call the condo rep. Recommend to clarify the instructions - a small nit, otherwise this condo was great! 1. Only comfortable piece of furniture in the entire place is the chair in the bedroom. Bed in master bedroom is awful2. T.V. in living room needs upgrading3. Not only do the remotes in the bedroom not work, the T.V itself only gets a picture occasionally4. The vanity lights in both baths do not provide enough light to do basic things like makeup5. Area rug in the living room would be nice since you want renters barefoot6. Cushions on the lanai furniture would help make them a little more comfortable7. Both towels and sheets are very poor quality and the sheets are very worn and barely fit the bed. Would not recommend this unit for mobility impaired people due to the fact the parking spot for this condo is very far removed from unit. Would not recommend this unit to anyone. Have stayed in four units in this complex and this is by far the worst. Stayed 10 days and the condo was perfect in every way. Location was ideal - just outside of downtown Kona and close to the small towns south of Kona. Perfect location on the ocean and every morning was spent on the lanai soaking in the sound of the waves. Cooler, boogie boards, snorkel equipment, tennis equipment, and much more to use during the many island adventures. Will definitely stay here again. The additional cost of the air was well worth it. Fans were adequate, but with the humidity, the air was welcome each night while sleeping. This is our fifth stay in 1801 and we are going back again in May. Since our last stay in November they have provided new linens and glass ware and a salad spinner. Their new property manager has taken the details of upkeep up a notch- all the light bulbs work, plenty of Kleenex boxes, toilet paper, and paper towels. They have the same house keepers who do a spotless thourough cleaning. This is all on top of one of the best locations in Kanaloa, not to mention Big Island. Proximity to the Keahoau Shopping Center with restaurants, movie theatre, KTA Supermarket and one of the best Saturday farmer's market on the island. From 1801's patio you would have to be in the ocean to be any closer. My favorite spot on the planet for my morning cappuccino! Very nice furnishings and outstanding ocean views. Quite and beautiful landscaping. We enjoyed the whales from the lanai every morning. Loved the Oceanside pool. Lovely condo in a prime location on the Kona coast. Well cared for older complex, right on the ocean, and this condo has one of the best oceanfront locations. Very private with endless views into the vast blue ocean. We enjoyed watching whales and passing boats over coffee on the lanai. The condo has been updated to contemporary expectations. The master bath is especially spacious. All appliances worked well, including the AC, which we only needed in the afternoon. A pleasant breeze in the morning and evening kept the condo comfortable. We would have appreciated those little touches that would have made this feel top drawer, like a box of tissues in each bathroom and enough bath soap to avoid carrying the tiny bar provided between the shower and sink. Also, we have stayed at alohacondos condos for years, and always enjoyed a modest "welcome basket" from the owners. None was provided here. All very minor issues, which we addressed by a casual trip to the drugstore up the hill. We will return to this lovely condo; the location makes it a winner. Thank you for your lovely note about about our condo 1801. We have taken care of all of your suggestions. We want our guests to have the best possible vacation and if there is something I can do to help I will. Best news the whales are here in force. The dolphins are here to complete our hawaiian experience. Lovely condo and dynamite location. I would not hesitate to stay again. When we arrived, we noticed the screen to the slider was torn and a repair was also needed to the bamboo window covering located in front of the slider. I informed Analyn of these issues of which she already knew. The Kanaloa complex is special because it feels small and intimate even though it has quite a few units. The way the units are "tucked in" the coastline a better name for the complex would be Kanaloa by the Sea. 1801 in particular is located on the far end where you are close to the sea as you can get without being in it. Hearing, smelling the ocean and watching the amazing displays of water splashing up against the rocks makes for a truely special stay. The condo is nicely decorated with beautiful artwork. The furniture is fairly comfortable. The overall ambiance is very nice. The TV's need updating, and it's time to replace some of the kitchen ware (glasses, dishes, gadgets). When we were there in hot August, the air conditioner performed well in the main part of the condo, fairly well in the second bedroom and poorly in the master. This last visit in November, the master was much more comfortable. However they have added a four hour timer on the air conditioner and when you are gone in the middle of the day and return in the hot afternoon it takes the system several hours to bring the inside temperature down from the early 80's to the mid 70's. We already have our next visit to 1801 booked! This was a great condo for our family. It is large and clean and has a perfect view of the setting sun. The only negative is the A/C system, it doesn't reach the master bedroom very well if at all. This would be a 5 star review if it was not uncomfortably hot in the master at night. Other than that we loved everything about the condo and the grounds. We spent a lot of time at the ocean pool and my kids loved it! We’re glad you enjoyed the condo and thank you for letting us know that the AC was not working properly in the bedroom – we will look into this promptly and correct any problems right away. If you stay with us again (and we sincerely hope you will), please don’t hesitate to contact us during your visit if you experience any difficulties whatsoever. 1801 has been our most pleasant stay and we are returning in November. Loved the location, the kitchen was well equipped, we had a great time! We were very pleased with the condo. The ocean view balcony was great, especially because of the nice sized table. It was really nice to enjoy meals overlooking the ocean. The location of the Condo was perfect for exploring the island, not too close to the most touristy areas, but not too far from grocery stores. The complex is very well cared for and the BBQ areas were clean and well lit. We had a great time with no complaints!!! Location great - condo condition poor! A/c ran 24/7, dryer noisy, place mats dirty, rugs in bathroom dirty & cheap, lanai railing rotted, outside kitchen rusted & paint peeling on doors, kitchen & bathroom cabinets hinges rusted & squeaky, TV remote in master didn't work, outside furniture needs painting, no light over dining table, no fan or light on lanai, beds in guest room noisy and bedding cheap & outdated, overall needs painting! Community amenities were great and location of condo is excellent! We enjoyed your condo very much for the 17 nights we stayed. I would prefer a little higher end TV and speakers in the main room. You could update that without breaking the bank. We never used the TV in the Master. The Master bed is just fair in terms of comfort, Again, an easy affordable upgrade would enhance. But, pretty much everything else is very comfortable and nice. The kitchen is very well outfitted, we never used the second room as it was just my wife and I, but it appeared comfortable. The setting is perfect, direct ocean front and protected from Northern and Western trade winds. You can't do anything about whom might be renting upstairs, we had some pretty noisy visitors there for a few days. The building is typical of Hawaii, not built too sound proof. Kanaloa as a property is one of the best in the Kona district in our opinion. We've stayed at several over the years. For what it's worth the so called "adult pool" (no kids under 14) was actually noisier than the other two kids ok pools. Funny how the geriatrics need to speak at the top of their lungs to be heard by everyone in the same county! We preferred the pool by the Ocean for that reason, even though we didn't go out there very often. Awsome view in a beautiful condo. The view from the lanai was beautiful. The sight and sound of the waves crashing in on the lava was great. The condo was modern, well equipped and beautiful. Everything you'd want. Central air was a real plus. It was pretty humid the week that we were there and we appreciated the cool environment. We'd definitely try to rent this condo on our next trip to the big island. Updated condo with great ocean front views! We really enjoyed our stay at unit 1801, Kanaloa at Kona. It is by far the best unit in that resort and we have stayed in several. We watched the local tourist boats watch and swim with the dolphins daily. The show usually started aroung 9am. Breakfast with entertainment. The condo was very clean and comfortable. The manta ray show started between 8 and 9pm at the mouth of Keauhou bay in front of the hotel. 6 to 8 boats showing lights on the water and people diving with the rays. We watched from the balcony.Would come back again. My wife, her daughter, and her granddaughter and I were amazed at how beautiful and ... perfect! ... this condo was. We do timeshare condos every year (and they're very good! ), and this was better than any of them. Fantastic view of the ocean from our balcony (close enough to catch some mist from the ocean spray), exceptionally well appointed in the kitchen, and a terrific cache of snorkeling and beach combing gear in the balcony storage. Five minutes from great snorkeling at Kahaluu Beach Park, and ten minutes away from a fun little town with shops and restaurants at Kailua-Kona. Fabulous spot. Definately need a car when you are staying on the big island. Town of Kona close by which had fabulous restaurants and great little shops to wonder around. The condo was more than big enough for our family of 4. Had one little issue with the washing machine overflowing, but that was fixed the following day. We had a good look around at areas to stay but would definately come back and stay here again. We have already recommended it to other family members who are coming over next year. All round a fabulous place. Kanaloa at Kona is the place to stay in Kona. The grounds are immaculate and the units are in as new condition. 1801 was even better than our first visit to KatK. The surf is literally at your feet. The view from the lanai over the ocean is great with long boats paddeling by. We enjoyed the sunsets from the lanai. All the amenities of the unit are first class including 3 TVs. We also enjoyed the included WiFi. We have stayed several times at the same resort and love this unit the best. It is close to the ocean and great sunsets. Love the fact you have everything to cook in and watch the sunsets and enjoy the piece and quiet. Thank you for keeping your unit stocked and ready to relax. Make sure you bring the information to get into the unit and the registration desk doesn't have anything to do with this unit.. Very nice condo right on the ocean with the surf breaking onto the lava rocks. Our only complaints were the TV in the living room was very old and the reception was poor, the wireless router went out on the last day and there was dirt and ants under the living room thatched rug. Tim, thanks for taking time to write a review, and we’re glad you enjoyed the condo and the location. If you consider staying with us again (and we sincerely hope you will), please don’t hesitate to call one of the numbers provided to you during your visit for service. We will address any maintenance or cleaning issues quickly. Some things dont work in the condo. The TV in the main area is outdated. Very limited cable channels to view. Lights and sockets not worked. The toaster didnt even work. Had an awesome time on vacation! Condo 1801 was everything we hoped it would be and Chuck was a pleasure to deal with. We have travelled extensively and found this condo to be top notch in location, amenities, comfort and beauty. The views are fantastic---watched the waves and saw whales regularly. The grounds are beautiful and very well maintained. Tune out your troubles with the sounds of waves splashing. The condo had absolutely gorgeous decor. The art work was intriguing. Very clean and spacious. The master bathroom was huge. The location was very close to great snorkeling...5 minute drive. The lanai was usable in the early morning but was very hot and humid in the afternoon. You can hear steps of the upstairs condo. Cable in the livingroom was not good but the bedroom's reception was excellent. We recently spent six nights at condo #1801 and had a wonderful experience. The complex is very well maintained and the unit itself is in one of the best locations - right on the edge of the water. The patio is very private, we ate many meals overlooking the ocean. The unit is in great shape, comfortable beds and lots of amenities. There was a large grocery store nearby and the location was convenient for exploring the east side of the island. We stayed there with my 80 years-old parents, who've never seen sunset on the ocean before. We have two girls as well. Three generations stayed this beautiful place. We all very much enjoyed everything until the last day. We were waiting for our swimming suits to dry in the dryer, and the house-keeper came one minute before 11:00 am. They were a bit rude. They came, and one opened the working dryer, my cloth fell on the floor and she used her dirty hand to pick up and threw it back to the dryer. It was a little thing, but it ruined our otherwise wonderful experience at 1801. I only wish the house keeper be well trained and have some good manners. We had very beginning to be there, and pleasant stay, but unsatisfied ending. Wonderfully relaxing. Incredible location on the water. What a gem! We'd return without hesitation. This location, just feet from the waves crashing on the lava rocks, is the best in the area. You're in your own private paradise. Gated community, friendly staff, very nice amenities, and close to town. A 12 on a 1 to 10 scale! Thanks very much for a wonderful stay. It is a comfortable condo located at a beautiful place. Check in is really convenient. It is equipped with snorkeling devices, beach chairs and towels, sun scream, etc, for the convenience of tourists. Fabulous location, with breaking waves just a few feet from the lanai. Roomy condo with lots of luxury touches. Well furnished, fully equipped and perfect for 2 couples. We thoroughly enjoyed every minute of our stay. We enjoyed the Condo imensly. I spent almost all day on the Lanai, watching and listening to the waves crashing ashore. The furniture is confortable and the whole place was just gorgeous. The owner has excellent taste in furniture and the local art as displayed in several paintings.If there is one (sight) negative, it would be the parking, which is quit a ways away. It was our 50th Wedding aniversery and I'm sure we shall return to this wonderful place. Unit 1801 was very nice. It was well stocked with little extras like beach towels. I do think the TV in the living room should be replaced. It was not possible to view selected channels do to the age of the TV where as the TV in the master bedroom could view the same channels just fine. If I were the owner of 1801 I would be very concerned about unit 1803 on the second floor. Every time the washing machine in 1803 was used the water pipes had a very severe "pipe knock." It was violent. This is due to poor plumbing design. It will eventually lead to cracked pipes and result in considerable water damage to both units 1803 and 1801. Beautiful, peaceful, a great value. The unit was clean, well appointed, beautifully decorated, and in a perfect location close to shops and snorkeling activities. The unit itself is ocean front so we enjoyed the serenade of the waves crashing on rocks throughout our stay. Spinner dolphins showed off their antics as we enjoyed dinner on the lani. The condos are off set from each other in a way that provides privacy and peace. The owner/mangager was very thoughtful to include tips to make our visit to the island the best possible. We enjoyed our stay at condo 1801. It was very clean and very well maintained. The view was the best part! My kids loved eating outside the lanai and watching the waves. The sunset was spectacular! When we come back to Kona will definately stay here again. A memorable stay that we will never forget. We absolutely loved this condo and where it was located. So close to any shopping needs and being right on the ocean was just wonderful. The view was breathtaking! We were a bit busy sightseeing and wish we would have had more time to sit on the patio. We had everything one could need for cooking meals and feeling right at home. I loved the huge shower in the master bath and the size of the bedroom. The one thing that freaked me out and took away a bit of the beauty was the rules one needed to follow to keep nasty creatures out. And seeing the ultra raid can. I was pretty scared that I would see or have to deal with one of your nasty centipedes or anything else on the list posted. I couldn't relax as much worrying about that and hoping their weren't any in the bed or to make sure they would not get into our luggage. Our centipedes can be killed with a fly swatter here. The fact that one lady there told me that she had to kill one with a scissors made me sick actually. And the fact that the have such a nasty bite. I hate ours in WI, but they are much smaller and don't bite. I just never knew I would have to deal with or think about that.But I guess warning your guests is better than them being surprised and knowing what to do to help them stay away. Staying in a condo was much better then staying in a hotel space wise and for the view, but I was just praying I could get back on the plane home and have said I never saw anything on the list. And thank god I didn't. And that you actually have to keep all food in the frig. I just don't know if I could live like that. But the place was very very clean. I was afraid to keep the windows open even with it being nice out fear that there would be a better chance of creatures getting in. The whole complex though seemed to be well taken care of. And was nice to have the tour guide right on the complex. I got hurt on Kauai so I never got to enjoy your wonderful pools. This was our second year on this island and this condo. Thoroughly loved everything about it. Has everything you need - lovely place to stay, beautiful view, quiet location, close to a great beach - I could go on and on. Looking forward to next year! Oh yea, the mongoose were a crack up to watch! 1801 is a spacious condo with an oustanding panoramic view. The unit sits right on the "beach",abuts against coastal lava rock and is oriented such that there is complete privacy on the lanai. Crashing waves, smell of the sea, sunsets---really, who wouldn't love that? The complex is nicely situated geographically if you have teenagers since it is easy to walk to downtown Kona, surfing, swimming. Master BR is roomy and uncluttered with a large high quality flat screen TV that also houses a DVD player. Smaller bedroom is indeed a smaller bedroom. Two beds. Little else. Would work very well with younger children. We had two teenage boys. Thankfully, overcrowding in that room led to bloodshed only once. Kitchen is good sized, plenty of "stuff." Living room furniture is outdated, seating is limited and couch/chairs are not particularly comfortable. Older TV, maybe 30 inches with picture quality consistent with an older TV that is 30 inches. This room is not totally unacceptable in a vacation locale where being outside is the attraction, but upgrading the living room furnishings to a much more comfortable, perhaps even a present century decor would be ideal. If you feel like coming back to a cool condo after a hot day in the sun (in August) look elsewhere. The air-conditioning system, for which you pay a surchage, is completely ineffective. Running 24/7 kept the temperature approx 78-80 degrees at night, 85 or so during the day. Without a doubt, this was the most disappointing aspect of the home. In summary, great oceanfront location tucked into a private corner of the complex with a magnificent view; many nice features, but sorely in need of a cash infusion to repair/replace air conditioning and update living area furnishings. These upgrades would easily make this unit outstanding inside and out, rather than a unit you'd find simply acceptable in exchange for its marvelous setting just feet from the Pacific. We recently went to Kanaloa at Kona for the 2nd time. This time we stayed water front in 1801. We loved the stay and the rooms were very nicely updated. twins in 2nd bedroom a little squeaky were the only complaint. pools and facility are very well taken care of. thanks for the beautiful accommodations. Would return in a heartbeat. Great place to stay, our second time there. The two bedrooms are of good size and the new master bath is beautiful. Close enough to Kona and shopping but far enough away so it is quiet and peaceful. The entire complex is very well cared for with pools and barbecues for you to use. Make sure to pay for the air conditioning. I think my only suggestion would be to improve the reception on the living room TV (the master bedroom TV is cool with a built in DVD player) and to improve the small appliances and cooking utensils in the kitchen. The kitchen itself is neat with new granite counters. We stayed in Unit 1801 for 3 nights in late July. The unit has an incredible ocean view from the lanai. The kitchen is fully furnished with everything you need for your stay. Shopping is conveniently close to stock up on food for your stay. The unit could have been cleaned a little better before our arrival, but overall it was a great stay for our family of 4. I Extended My Stay, and I Thank-You! This is a wonderful condo. I wish I lived here! You cannot get more ocean-front without being in the ocean. Our evenings were spent watching the sunset, looking at the stars and listening to the waves. We never ate out at night, we either cooked or got take-out as we couldn't imagine having a better view. There is a wet bar on the lanai, too, so that was nice! 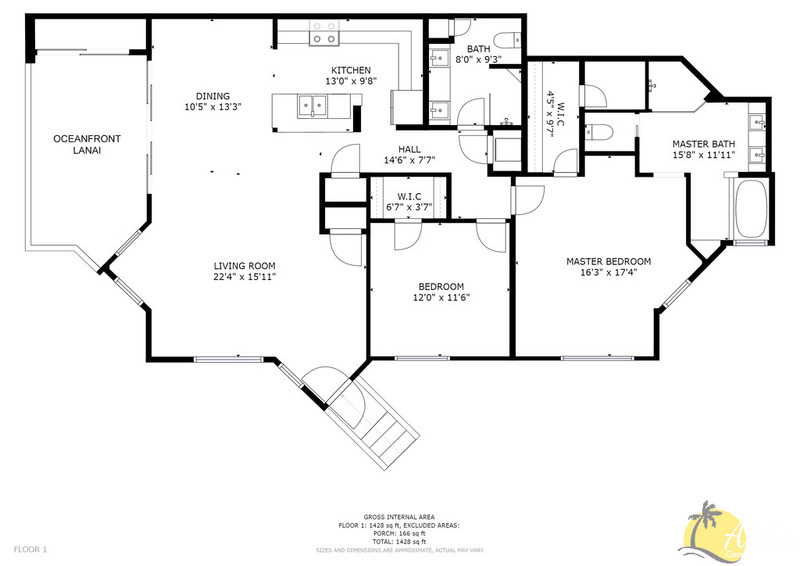 The floor plan is perfect. Spacious, with an open kitchen that was beautiful and has everything you could ever need. Large tile runs throughout the condo and keeps it nice and cool. The furnishings were very nice as well. The master bedroom is large with a very nice bathroom (awesome shower with 2 showerheads). The 2nd bedroom good-sized too. (There is also a pull-out bed in living room) It is a very quiet area, so with the windows open, you could hear the waves at night. Couple that with a very comfortable bed made for some of the best sleep we have ever had. We opted not to use the a/c, and with the windows and lanai open, there was a wonderful breeze. At night, it was cool and very comfortable. During the day, it was warm, but not bad at all. None of us minded, we weren't in Hawaii to be in a/c the whole time. The furnishings were very nice. There is a kid-friendly pool and adults-only pool on the property. As we only went to the kid-friendly one, I can tell you it was very nice and never crowded. The grounds were very well maintained. There is a grill very close to the condo as well. It really was perfect and it felt like you were coming home when you came back to the condo. The next time we come to the big island, we will stay here. We stayed at this complex years ago and found this unit online. The price was right and the unit very nice. The lanai was great. The May weather was great & w/ fans, no A/C was desired. There were some beach chairs and stuff to borrow & we left the boogie board we bought. The kitchen was well outfitted, although we brought a few sharp knives for cooking. If you kitchen clean with a cloth, not sponge, bring one with you. There's a coffee maker that needs #4 filters. They need a few more smaller acrylic glasses for pool/small kid use, but plastic cups can be bought at the store too. There's a nice gas bbq and grassy area with table/chairs not too far away for those eat-in days. The tennis courts are in good shape. The pools are never busy, but the pool nazi leaves you in the dark without warning after posted hours. There's no beach right there, but not too bad a drive. Washer/dryer is helpful for beach towels. We'll be here next time we're in HI! We spent a wonderful few days and had a great time. This isthe first time that we stayed in a vacation rental home instead of a hotel -- and it was perfect.The condo is closer to the sea then any hotel. We stayed in unit 1801 which we highly recommend. The ocean front lani was fabulous. The condo was spacious and very nicely furnished. There was even beach and snorkel equipment for use. If we are able to return to Kona we would absolutely try to get this unit. We loved the condo! The kitchen was very modern with beautiful granite counter tops, the master suite was great with a really nice shower. The lanai was wonderful. We loved to sit and admire the beautiful Kona sunsets and unbelievable crashing waves. The complex is very quiet and relaxing. We just loved it!! The condo is beautiful and spacious. Two couples stayed and enjoyed the amenities of the condo, resort and area. The condo was completly updated. Our balcony had an unobtructed view of the ocean and sunsets. We saw dolphins 3 times! The pool was clean and warm and was never crowded. Unfortunately the restaurant and bar next to the pool was not in service. the area is quiet by only minutes away from the Kailua Kona. My wife and I spent four nights in this beautiful condominium and had a great time. It is located right on the ocean and has a great lanai for viewing the setting sun. Unit was well decorated and we particularly liked the fact that all floors were ceramic tile - very cool and easy to keep clean. Our only complaint was we occasionally heard noise from upstairs and next door neighbors. We had been going to Kauai and decided to try the Big Island. Our condo at Kanaloa was perfect for what we wanted to do. It was large, well appointed and in a wonderful location. We were a bit surprised that we had to pay extra for air conditioning but all other expenses were in line with what we had paid for other condos. We loved this condo. There were only two of us who actually stayed here, but it was the hub for our whole family, part of which stayed in another condo. The location was perfect and the lanai was heavenly. This was our slice of paradise for a week. The kitchen was stocked with all the essentials and there were boogie boards and pool noodles available, too. Furniture was fine, the unit has been tastefully remodeled and is nicely decorated. We were very comfortable. Thanks for everything! We stayed at this condo twice, in 2006 and 2008. It was remodeled between our visits, improving on what was already a lovely place to stay. It has two bedrooms. The master suite is large with a big bathroom and a Jaccuzzi hot tub. The lanai overlooks the ocean--you hear it 24/7, very relaxing with beautiful sunsets. 2nd bathroom is also large. Great kitchen, dishwasher, big refrigerator. Washer and dryer work well. Beautiful grounds and pools. Read our review plus others on Trip Advisor--we rented the condo based on those reviews and pictures online. Reviewed by Chris and Pam R.
Our stay at this condo was a very enjoyable and relaxing experience. There's nothing like getting up in the morning, making a cup of coffee, and sitting on the lanai relaxing to the sound of the surf and the sight of the ocean! The condo was well-supplied, clean, and comfortable. The grounds were beautiful, clean, and peaceful.This was definitely the best place we've stayed at in our three trips to the islands. We're spoiled now!The only thing that would have made our stay better was if the complex had a bar/restaurant. Still, the drive to town wasn't all that far.We can't wait until we have the opportunity to return.